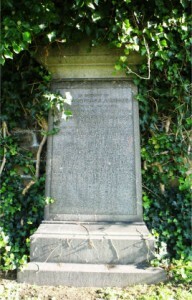 A modest stone in the Necropolis (Kappa 77) erected by James P Jamieson commemorates members of his family. The surname Papillon borne by three of the people named on the stone suggests there may be some sort of connection with Pierre Jacques Papillon who is credited with successfully introducing Turkey-red dying to Glasgow in 1785. Thus the stone has been raised by William Papillon Jamieson in memory of his mother Elizabeth Papillon nee Jamieson, two unmarried Jamieson aunts and his sister Alexis Snodgrass Papillon but there is no mention of his father. The burial register adds a few more details to those given on the stone. We find that J.P. Jamieson was resident in Gourock at his death in 1869, his sister Alexis died of consumption in 1842, his aunt Alexis of cholera in 1849, his other aunt, Ann, of debility also in 1849 and his mother, Elizabeth of bronchitis in 1852. Elizabeth Jamieson is also recorded as being the wife of Charles Papillon, dyer. This last fact is most intriguing as it introduces another man by the name of Papillon to Glasgow and makes one ask what relationship, if any, he had to Pierre Jacques Papillon of Turkey-red fame. Before turning to this question it might be best to complete the investigation and recording of the Jamieson family named above. The majority of the research into this family has been carried out on the internet and is necessarily incomplete due to that constraint. Banns for the marriage of Elizabeth Jamieson, daughter of the late James Jamieson, Comptroller of the Customs, Glasgow and Charles Papillion (sic), dyer of Bridgeton were called on 18th September 1803 in Barony Parish but the date of their marriage is unrecorded. The birth date for Peter James Papillon fits with the age of the man known later as James Papillon Jamieson and, from other evidence, it seems that his brother William Charles Papillon became William Papillon Jamison. In both cases the sons adopted their mother’s maiden name while the daughter retained her father’s surname. In 1841 the census of that year showed Alexis Papillon living with her maternal aunts Ann and Alexis Jameson (sic) at West Regent Street, Glasgow while her mother and brother James were living at Hunters Quay, near Dunoon in Cowal. There was no sign of James’s younger brother in Glasgow in 1841 and subsequent research suggested that he was alive but had left home. By the time of the 1851 census only J.P. Jamieson and his mother were found alive in Glasgow. They were living together, with two servants, at 122 Hope Street and both gave their occupation as annuitant. When Elizabeth Jamieson or Papillon died next year she (and presumably J.P. Jamieson) was residing at 105 Hill Street, Glasgow. By the 1861 census J.P. Jamieson was found living in some state in a house of twelve rooms at 5 George Street, Gourock with two live in servants. His occupation was given as ‘Railway and Fundholder’ and it was noticeable that there were five other persons also listed as fundholder on the same page of the census enumeration book. He died in Gourock eight years later. The Glasgow Directories and subsequent Post Office Directories of the period gave four house addresses for J.P. Jamieson over a twenty year period. He was first found living at 68 West Regent Street and this probably coincides with the address given for Alexis Papillon and her aunts at the 1841 census though no street number is given in the census. The family moved to 122 Hope Street 1843/44 and remained there till 1851/52 at which point Jamieson and his mother, the sole survivors, moved to 105 Hill Street, Garnethill with Jamieson himself moving along the street to number 60 c1855 and remaining there until 1858 when he disappeared from the directories presumably after moving to Gourock. Jamieson also appeared in the directories in a business capacity. His first appearance seems to be in 1829-30 when the firm of Jamieson & Thomson, manufacturers, 62 Queen Street is listed. The designation soon changed to Jamieson & Thomson, Pullicate & Gingham Manufacturers with an address at 3 Royal Exchange Square. The reason for the move to Royal Exchange Square was due to the fact that a serious fire in Queen Street in January 1832 destroyed the premises of a number of manufacturers, warehouses and shops including those of Jamieson & Thomson. The partnership seems to have been dissolved 1837/38 and from then until 1848 Jamieson traded as J.P. Jamieson & Co, Pullicate & Gingham Manufacturers, 3 Royal Exchange Square. After 1848 there is no more mention of the firm in the directories and for the next ten years till he disappears from the directories Jamieson describes himself simply as a merchant. 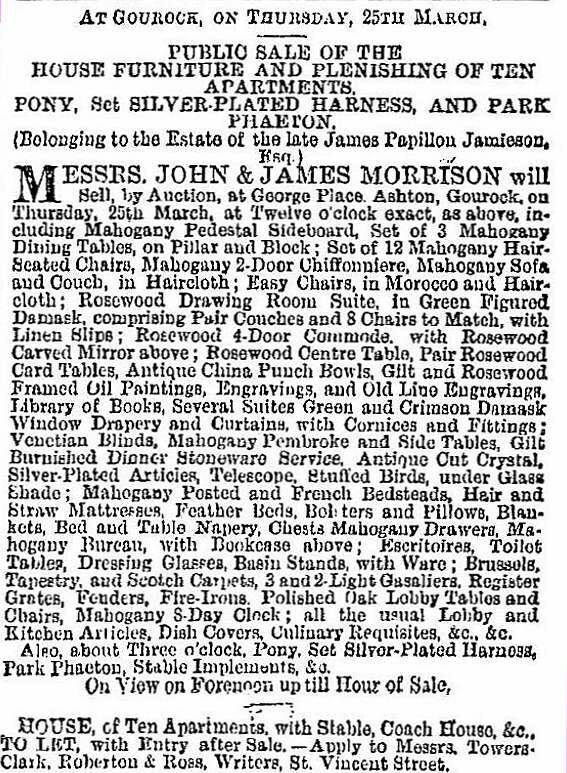 J.P. Jamieson died on the 2nd March 1869 at Gourock and on the 22nd of that month an advert appeared in the Glasgow Herald announcing a public sale of the furniture and furnishing of his house there. There is a detailed description of what was to be sold which gives an interesting picture of what a well furnished house of that period contained. The reason for the sale is apparent when one looks at Jamieson’s will. His will was first drawn up in 1858 and it is obvious from reading the eleven codicils added to it before his death to it that he was a man who took umbrage easily and regularly modified the personal legacies in the will. 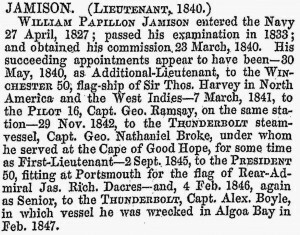 In 1858 Jamieson was still unmarried and his only close relative was his brother William P Jamison living in South Africa. One might have thought he would leave his estate to this brother but William is only left fifty pounds sterling “on account of his very extraordinary and most unbrotherly conduct when after an absence of nearly sixteen years he passed through his native […] from a tour of some weeks in the Highlands without ever once taking the trouble to call upon me for this as well as for other reasons unnecessary to mention in this deed and supposing him possessed of ample means”. After a number of other small bequests he intended to leave the bulk of his fortune to seventeen local charities. By 1863 however William was back in his brother’s good books and, in a new codicil, was made residuary legatee after substantial bequests to charities. When Jamieson died in 1869 he left a total personal estate of £15394 13s 8d. The household effects advertised above realized £255 16s 9d while the vast majority of his estate was made up of railway stock. His charitable bequests amounted to £10000 so his brother William must have received about £5000 allowing for legal expenses. William Papillon Jamison does not show up in Glasgow except for his birth as William Charles Papillon in 1808 and the announcement of his marriage in the Glasgow Herald of 24th June 1844. It turns out that W.P. 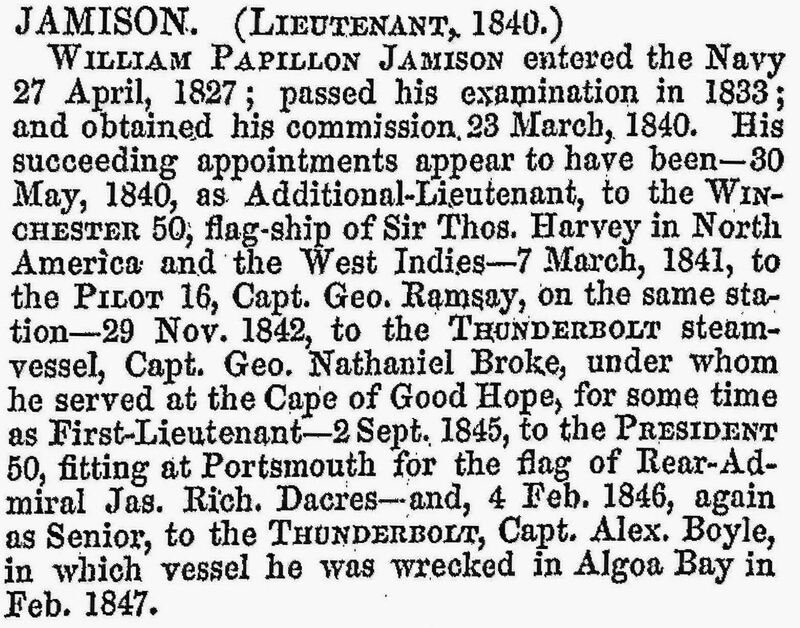 Jamison joined the Royal Navy in 1827 at the age of 18. He first crops up in “A List of Mates in the Royal Navy, January 1, 1840” which was reprinted in the Hampshire Telegraph and Sussex Chronicle on 2nd March 1840 from a Parliamentary paper. W.P. 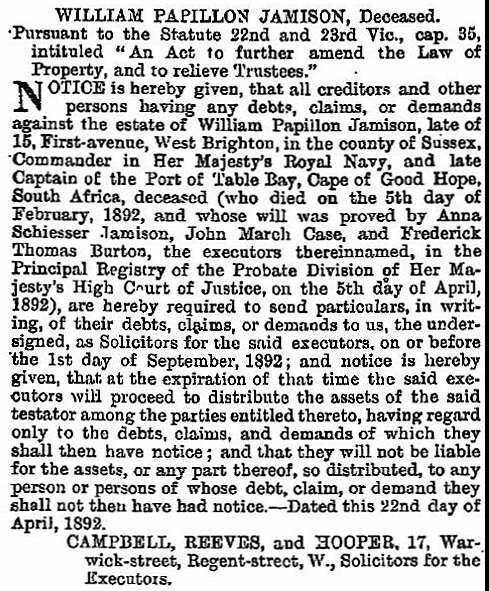 Jamison is listed in this as having passed his lieutenant’s examination in 1833 and to be serving at present on the Royal George. This was one route of promotion for executive officers in the Royal Navy at this time. A midshipman who had passed his examination for lieutenant could become a master’s mate until such time as he received promotion to lieutenant. His early Naval career up until 1849 is conveniently summarized in William R O’Byrne’s A Naval Biographical Dictionary: Comprising the Life and Services of Every Living Officer in Her Majesty’s Navy, from the Rank of Admiral of the Fleet to that of Lieutenant, Inclusive, 1849. O’Byrne, William R.. A Naval Biographical Dictionary: Comprising the Life and Services of Every Living Officer in Her Majesty’s Navy, from the Rank of Admiral of the Fleet to that of Lieutenant, Inclusive, 1849. There is a miniature of him in existence painted in 1842 by Edward Robertson. It shows him wearing Naval uniform, blue coat, white waistcoat, large tied black stock and medal. It may have been painted to celebrate his promotion to Lieutenant in 1840 or was it a present for his future wife? and retired from the Navy with the rank of Commander about 1862. It was a surprise to discover that he died in Hove, Sussex on 5 February 1892. He has not been found in the 1891 Census for the UK so must presumably have arrived after 5th April 1891. One wonders what brought him to England when he was about 84 years of age, had he come on holiday or had he returned permanently? There is also the question of who was Anna Schiesser Jamison, one of his executors. In another legal notification she is specifically described as a spinster so it is possible that she was William’s daughter but I have not found any evidence of that. In fact it is not known at present whether William and Sophia had any children. William’s will was proved in England and he left an estate valued at £33856 16s 4d. It is not known whether he was accompanied to England by his wife Sophia. 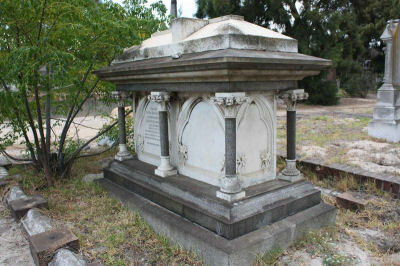 She survived him for seven years and died in 1899 and is buried in Woltemade Cemetery, Maitland, Cape Town. So far nothing has been found to suggest that the Jamiesons could be descended from Pierre Jacques Papillon who is credited with successfully introduced Turkey red dying to Glasgow and Britain in 1785 apart from the fact that Elizabeth Jamieson’s husband and their father was one Charles Papillon. PJ Papillon is always mentioned in accounts of the history of dyeing in Britain but very little seems to be known about him. The fullest account of the establishment of Turkey red dyeing in Glasgow seems to be that found in The Statistical Account of Scotland 1791-1799 for Barony of Glasgow Parish in volume 12 at page 114 and subsequent accounts are based on this, sometimes almost word-for-word. Turkey-red dye produced a bright red colour which does not fade in sunlight and was much admired. The technique for successfully producing yarn and cloth using this dye was introduced to France from the Adrianople area of Turkey in the middle of the 18th century. The centre of French Turkey-red dyeing was Rouen and from about 1770 manufacturers, particularly from Manchester, tried to introduce it to Britain. In the mid 1780s there seems to have been a downturn in the Rouen trade and some French dyers were persuaded to come to England. Amongst them was Pierre Jacques Papillon who came to Manchester in 1785. He was unsuccessful in establishing himself there and later the same year moved to Glasgow at the behest of George McIntosh of Dunchattan. Published information about Papillon in Glasgow is scant and much seems to be anecdotal. P.J. Papillon came to Glasgow sometime in 1785 to introduce Turkey red dyeing at MacIntosh & Dale’s dyeworks in Barrowfield, near Rutherglen Bridge. By January 1787 he had left the firm, according to a letter from George McIntosh to his son Charles, so he only lasted there a matter of eighteen months or so. From scraps in the early Glasgow directories and early newspapers it is possible to construct a basic outline of Papillon’s time in Glasgow. 1809 Papilon, Chas. Dyed yarn warehouse, 44, St. A[ndrews?]. Sq. There seems to be a gap in the record after Papillon parts company with the Macintoshes but by 1790-91 he is listed in the Glasgow Directory of that year as a cotton dyer at Rutherglen Bridge – that is in Bridgeton, probably near the Barrowfield Dyeworks. He is still there in 1799 and has a second entry as a manufacturer based in Brunswick Street. Two years later in 1801 the dyeworks are in the hands of a Charles Papillon and P.J. Papillon is simply a manufacturer in Brunswick Street. This entry of 1801 is the last time P.J. Papillon appears in a Glasgow Directory. 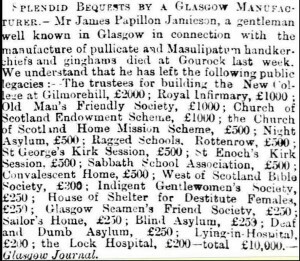 James Muir in his book Glasgow Streets and Places: Notes and Memoranda, 1899 has a note against his entry for Papillon Street, afterwards French Street, that in March 1799 Papillon’s dyeworks at Rutherglen Bridge are advertised for sale. This suggests he was in financial difficulties though in 1801 a Charles Papillon, presumably a relative, has the Rutherglen Bridge dyeworks. It has proved possible to confirm that Charles Papillon was in fact a son of PJ Papillon and identify another son thanks to the happy accident that PJ Papillon and two sons became naturalized British subjects in 1799. 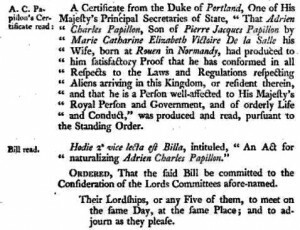 This procedure needed a private Act of Parliament to be passed, and part of the legal process for this required the issuing of a certificate stating that “X had produced […]satisfactory Proof that he has conformed in all Respects to the Laws and Regulations respecting Aliens arriving in this Kingdom, or resident therein, and that he is a Person well-affected to His Majesty’s Royal Person and Government, and of orderly Life and Conduct.” The House of Lords Journal for 1799 records two of these certificates, one for Pierre Jacques Papillon and his son Pierre Francois Papillon and a separate one for his son Adrien Charles Papillon. Pierre Francois Papillon cannot be traced further. P.J. Papillon’s wife and the mother of these two sons is named as Marie Catharine Elizabeth Victoire De la Salle though, as she is not included in the application for naturalization, it seems she was dead by 1799. However Memoirs and portraits of one hundred Glasgow men (1886) says that P.J. Papillon left a widow who lived in poverty until Peter MacKenzie, publisher of the Reformers’ Gazette, helped her to gain an annuity of £75. This story is based on the article below from the Glasgow Herald of 11th August 1851 copying one from the Reformers’ Gazette. THE TURKEY-RED DYER IN GLASGOW. “Sir,—I take the liberty of troubling you at present with a very brief statement of my present situation, in consequence of seeing in your paper, dated 19th July, No, 39 of Northern Notes and Queries, where allusion is made to the names of some of the streets in this locality; I am the widow of the late Peter Jas. Papillon there alluded to, as the first who introduced the Turkey-red dyeing into this country, to whose merits your correspondent has done great justice. I am very sorry, however, to inform you that since my husband’s death my circumstances have been far from comfortable, having no place of residence of my own but with a widowed sister, who is unable to provide for herself, far less from assisting me. I will, therefore, esteem it a very great favour, indeed, if you will have the goodness to represent my case to any gentleman of your acquaintance who would have the goodness to represent my situation in the proper quarter for obtaining some relief to me from any of the numerous benevolent institutions in the city. I am happy to say that several respectable gentlemen of my husband’s acquaintance have been very kind to me indeed, otherwise my situation would have been altogether intolerable; my health has been very bad for the last four months, and in consequence of my daughter’s death, it has been much worse for the latter part of that period. I hope you will not be offended at the liberty taken in troubling you, and you are at liberty to make any use of this you judge proper for obtaining my request. Now, we have no hesitation in saying that this is a case which at once recommends itself to the attention of the public of Glasgow. Among our benevolent institutions—our Merchants’ Houses, our Trades’ Houses, and other similar dispensers of charitable legacies to the reduced in circumstances, is there none that can afford a small annuity to the widow of Peter James Papillon? Princely fortunes have been realized by the Turkey red dye in this city; it has contributed largely to our manufacturing celebrity. May we not ask therefore whether, among our merchant princes and eminent manufacturing firms, some influence (if not money) may be spared to place at least above the fear of want the worthy and respectable widow of one who conferred so memorable a boon upon Scotland, and whose name is so honourably associated with one of the first advances of our city in its progress to manufacturing eminence. We do not say that Mrs. Papillon has been altogether neglected. It appears from her letter that she has occasionally experienced not a little kindness from several gentlemen who were on terms of intimacy with her husband. For this we have no doubt she is sufficiently grateful; but it is humiliating to be the recipient of mere private bounty, which is precarious at the best; and therefore we trust that Mrs. Papillon’s case—as that of one who for the remainder of her days has really a strong claim to some charitable annuity, as a widow in reduced circumstances—will be immediately considered and acknowledged in the proper quarters. This Jane Papillon can possibly be identified with the Jean Pappilon, widow, aged 66, born in Edinburgh who was visiting Alexander and Margret Lawson at 47 Rumford St, Calton on census night 1851 (30th March) and the Jane Papylon, widow of a dyer, who died at 36 Main St, Bridgeton on 12th April 1860 aged 76. It is most unfortunate that between 1856 and 1860 the name of a person’s spouse is not entered on their death certificate so we only know that Jane Papylon was married to an unnamed dyer. Her death was registered by her sister Margaret Lawson which is a link between the two entries. Turning now to Adrien Charles Papillon who was naturalized in 1799 along with his father and brother this is surely the Charles Papillon who appears in the Glasgow directories from 1801 onwards and who married Elizabeth Jamieson in 1803. 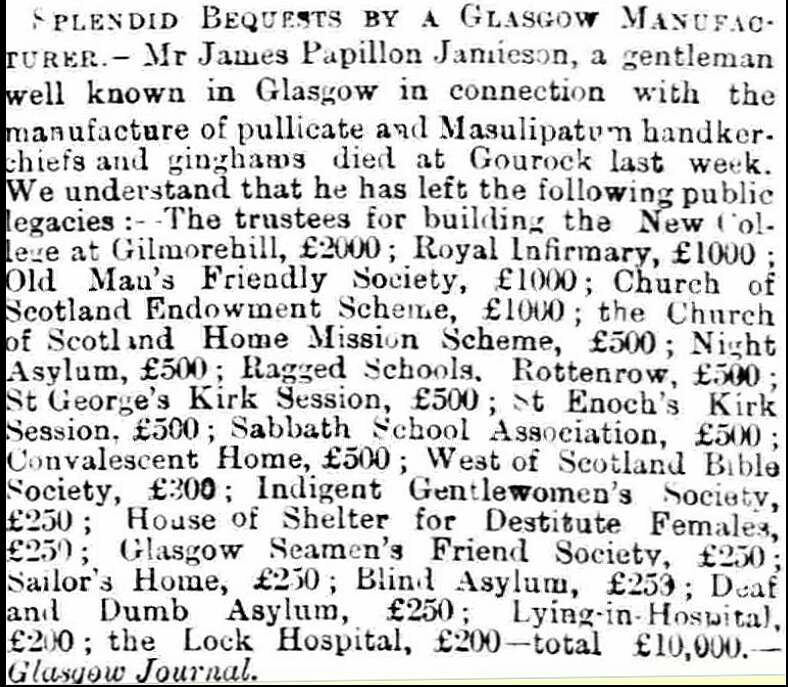 Charles Papilon (sic) disappears from the Glasgow directories after 1810 and a number of newspaper reports and adverts provide a possible explanation. In 1807 it is reported that Charles Papillon’s dye works at Meadowfield near Glasgow burnt down. and seven years later it was announced that his creditors would receive a dividend though it is not clear whether this was the first dividend to be paid or not. Nor is it clear whether Charles Papillon was still alive in 1818. It is noticeable that Charles and Elizabeth Papillon’s three children were born at regular intervals between 1804 and 1808 and none appeared after the later date. Elizabeth died at the age of 70 in 1852 so she was only about 26 years old when her last child was born with many years of reproductive life ahead of her. Barring medical reasons the lack of further children suggests one of two possibilities: either her husband died or they separated. The fact that there do not seem to be any more references at all to Charles Papillon seems to suggest that he did in fact die soon after 1810. It seemed expedient to his two sons to abandon their paternal surname and adopt that of their mother instead though both kept Papillon as a middle name. In the case of J.P. Jamieson this was surely because the Jamieson name was better known in Glasgow through his grandfather James Jamieson, merchant and Comptroller of Customs and J.P. Jamieson chose to trade on that fact. It is impossible to suggest what the reasons were behind W.P. Jamison dropping the name Papillon and even adopting a different spelling of Jamieson. There are a small number of tantalizing entries on the internet which might allow us to speculate further on the possible fate of P.J. Papillon but it must be stressed that more research is needed to prove what follows. We need to start with the fact that Jane Papylon who died in 1860 aged 76 was described as the daughter of James Muir and Ellen Lawson on her death certificate. As the information was supplied by her sister we may take it that this is correct and that Jane Muir was born c1784. Now it so happens that there is the record of a marriage between a Peter James Papillon, widower, of St Mary Magdalene parish, Bermondsey, Surrey to Jane Muir of the parish of St George the Martyr, Southwark by license on 30th April 1808 at St George the Martyr. This is a very interesting entry and immediately raises the question as to whether it is likely there could be more than one man in Britain at this time with the name Pierre Jacques (Peter James) Papillon. Jane Papylon nee Muir who died in 1860 would have been about 24 at this time so is a possible match age-wise for the Jane Muir who married in 1808. Three years later in 1811 Holden’s Annual London and Country Directory, of the United Kingdoms, and Wales, in Three Volumes, for the Year 1811 contains an entry for P.J. Papillon, calico printer & bandanna manufacturer, Neckinger, Bermonsey and a Peter Papillon, merchant, is listed as living at Spa House, Spa road, Bermonsey. There are also two interesting christenings in the baptismal registers of St George the Martyr, Southwark. On 13th April 1807 Peter James Papillon son of Peter James and Jane Papillon was christened and on the 21st July 1819 Harriot Albert Mary Eleanor Papillon daughter of Peter James and Jane Papillon of Great Suffolk(?) Street was christened. Imagine my surprise when I found the banns for a marriage of Hariet Albert Mary Elenor Papillon to John Robertson in Glasgow on 18th July 1847. What are the odds for there being two girls with the same four Christian names in the same order? It would help greatly if there was any trace of Jane Papillon and her two children in the 1841 census to show where they were living but there does not seem to be. Jane Pappilon was found in the 1851 census visiting her sister but there is no trace of daughter Harriet who was married to John Robertson by then. In fact, in the letter written by Jane Papillon to Peter Mackenzie in August 1851 quoted above she refers to the death of an unnamed daughter which, by implication seemed to have taken place fairly recently – before or after 30th March 1851, census night? The facts set out above allows us to postulate that P.J. Papillon gave up his business in Glasgow to his son Charles about 1801 and moved to London where, following his former trade, he set himself up as a calico printer and bandanna manufacturer. He married Jane Muir as his second wife and they had at least two children. Jane must have been considerably younger than her husband and, on being left a widow, she and her daughter came to Glasgow at some unknown time before Harriet’s marriage in 1847. P.J. Papillon did not provide for his wife and child on his death or else Jane Papillon was improvident and this led to the letter to Peter Mackenzie in 1851. The known facts allow for this hypothesis but it needs proving so should be regarded as flagging up some future lines of research.